My complexion was dull and oily, my skin tone uneven. 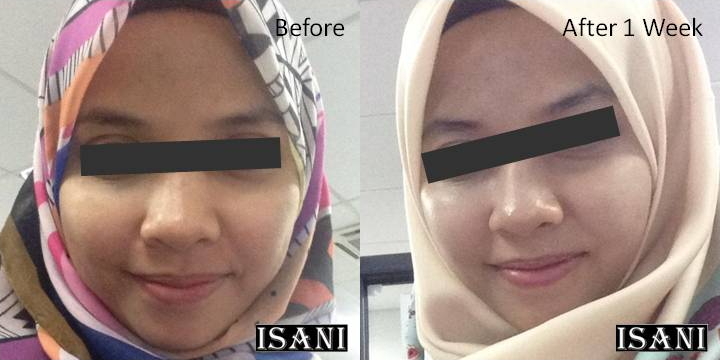 But a week after using ISANI my complexion is now soft and smooth. My friends commented that I am prettier now. Thanks to ISANI skin health. My facial complexion was dull. But after using ISANI for a week it is now not only smooth and shiny, but also looks lifted and feels tighten. The facial pores and eye bags have reduced and I am now confident enough to go out without applying make-up. Thanks to ISANI. 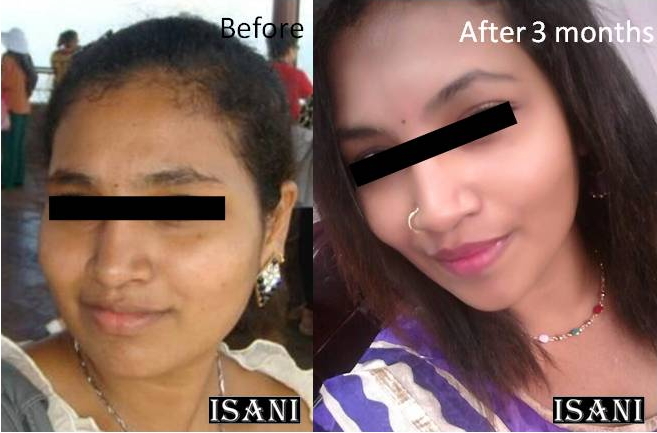 I came to know about ISANI during my work as confinement lady. Out of curiosity I bought a box and started using it. The effect of ISANI on my face is almost immediately so noticeable: my face is no longer oily, my freckles have lightened up and my skin tone becomes even and brighter. My husband notices the change and says I look much younger. My daughter was born with sensitive skin: her face was always red and itched. After I washed her with ISANI Skin Health Bar for a week I was encouraged to notice the redness and itchiness much-reduced. I am glad I was introduced to ISANI. It is a natural product which is also friendly for baby’s skin. My facial skin is oily, has black heads and big pores. 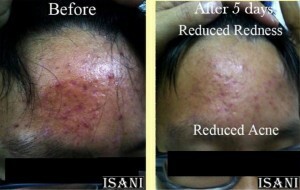 After using ISANI for a week the black head and oiliness are now reduced. My skin now feels fresh and my skin tone is even. Thank you ISANI. It’s really natural beauty. For a long time I experienced a host of skin problems: freckles, white spots, uneven skin tone. I tried skincare products but the chemicals in them worsened my problems. Then I was introduced to ISANI. I used ISANI 3 times daily the first week. 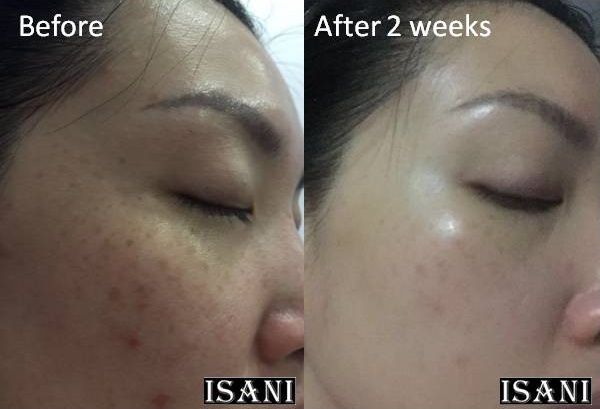 I was encouraged when after 2 weeks, I noticed almost 80% of my freckles started to fade, my skin tone looked even and my skin was firmer. 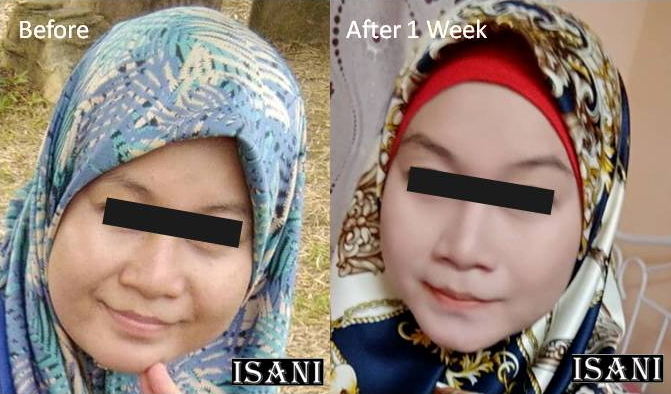 ISANI reinstated my self-confidence even though I now do not apply any make-up. 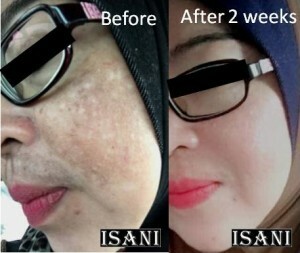 I love my skin and will keep on using ISANI. 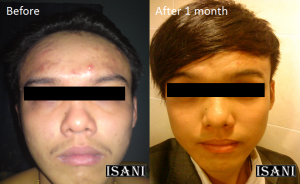 Within 3 months, I’m able to see dramatic changes on my pimples mark, well improved. No more oily skin. Mainly, the chicken pox scar below my eyes have faded off. 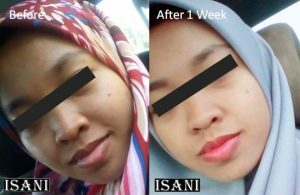 As a University student, I’ll be always rushing for my class in the morning, but now by using ISANI I don’t have to worry about time & money on beauty products. ISANI truly makes my life much easier & better. Right after giving birth, I started to get a lot of pimples and my skin was so dull looking. I refused to use any products on my skin, because I did not want to expose my baby to any harmful chemicals, as I was nursing. My mom, who is a dermatologist told me about ISANI Skin Health bar. 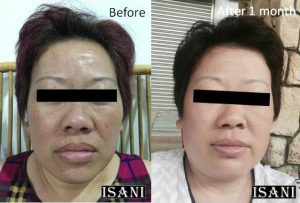 She said it was a great product that her patients love, and IT IS ALL NATURAL ingredients. 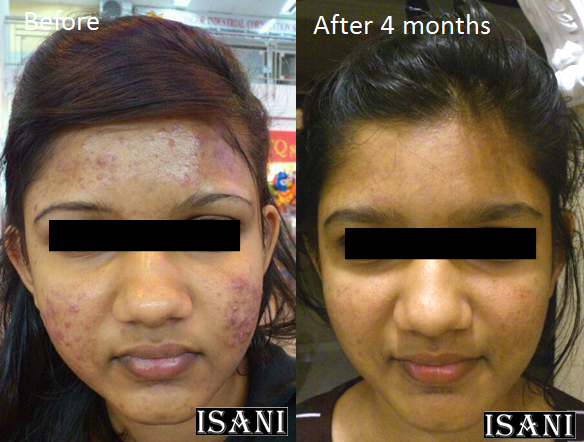 Once I started using ISANI, my skin became brighter, smoother, and my pimples and scars vanished! I love this product and would highly recommend it to anyone who wants healthier and younger looking skin. I had blackheads, pigmentation and regular breakouts of rashes. My face was full of scars and I applied makeup to cover the scars. 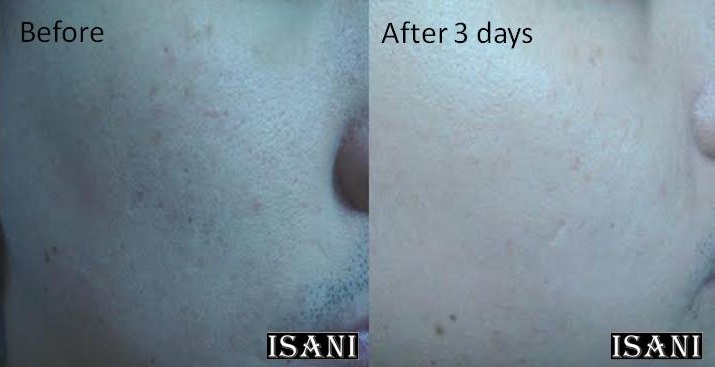 After using ISANI for seven weeks I noticed that it not only cleared up the blackheads and reduced my pigmentation, but it does not make my skin feel dry or peel off. Miraculously my skin feels refreshed and soft. It’s truly amazing. I still cannot believe that a single product can heal in so many ways. My problem was freckles and uneven skin tone on my face. 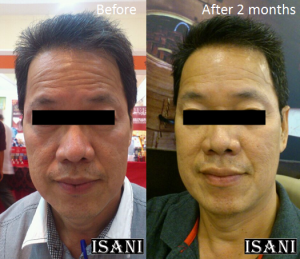 In a desperate effort to get rid of them I even went for laser treatment, among other facial treatments. None worked. My baby has sensitive skin on her forehead. I tried many products but it did not work. As a mother, I felt so helpless to see her suffering everyday. 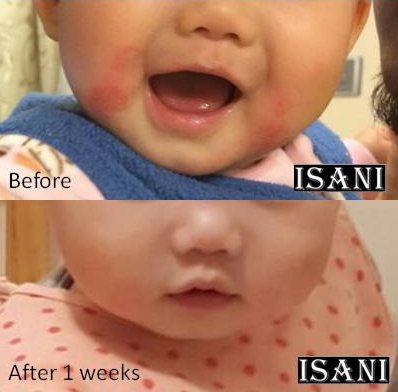 Using ISANI has improved my baby’s sensitive skin and it even looks shiny! Happy baby, happy mummy, thanks to ISANI! Whenever I was stressed I got a breakout of pimples and acne. Being easily stressed, pimples and acne were my constant problem. When I met people I felt as if they were staring at my acne instead of listening to what I was saying. 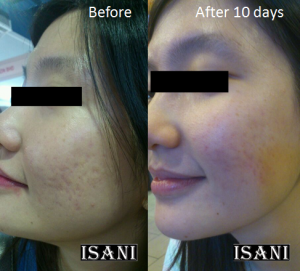 After using ISANI for a month my acne gradually disappeared. My skin is now clearer and glowing. I now talk to my clients with confidence. Thanks to ISANI. I will not hesitate to recommend it to my friends and colleagues. I have been having acne problem for nearly 2 years and I have tried a lot of products which did not work. 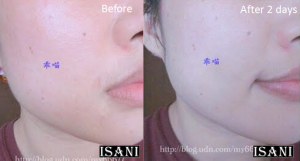 I also tried medication from dermatologist and anti acne cleansing product but it did not show any improvement. My sister introduced ISANI to me and within just 2 months, the acne on my face reduced dramatically and the scars have lighten up. 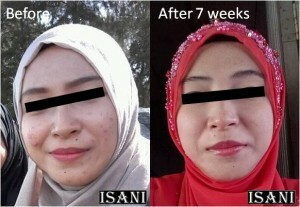 I am very thankful to ISANI and now I can finally get rid of the expensive cosmetic and skincare products. I received an ISANI sample from the Facebook giveaway. 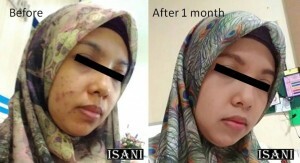 After using it, I felt my skin is softer and tighter after only my first trial. 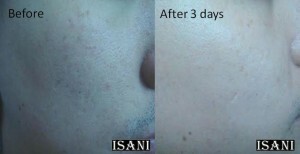 After 3 days, my facial pores have reduced and my face is smoother and glowing. 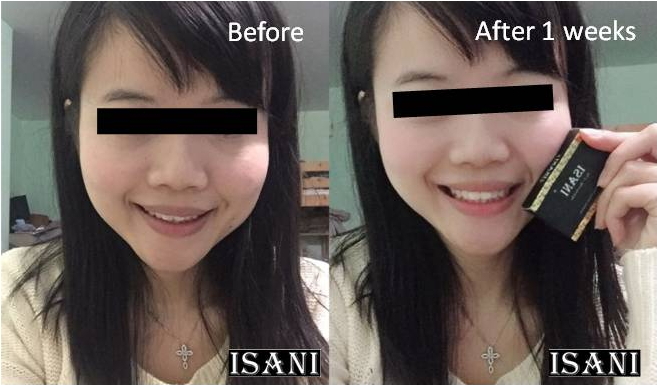 ISANI is truly a Skin Health Bar. I will keep using it and will recommend it to my friends and family. 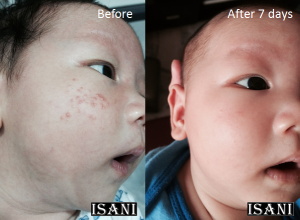 My baby started to develop acne when he was 2 weeks old. 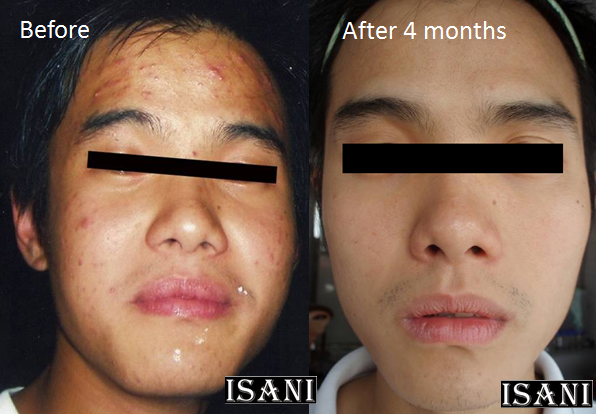 I try ISANI on him and what amaze me is the rapid recovery and it doesn’t cause any irritate on his skin at all. I am glad I found a natural product and now I bath my baby head to toe daily with ISANI. I am a performer, I always put on heavy make up to cover my wrinkles when I have performance. I have more confidence even without putting on make up now. I had my skin problem started when I worked as a kitchen helper. I spent a lot for my face in the beauty saloon but it just remain same and got worst day by day! My problem solved when I come to know ISANI. My skin restore and I got back my smooth and nice skin. 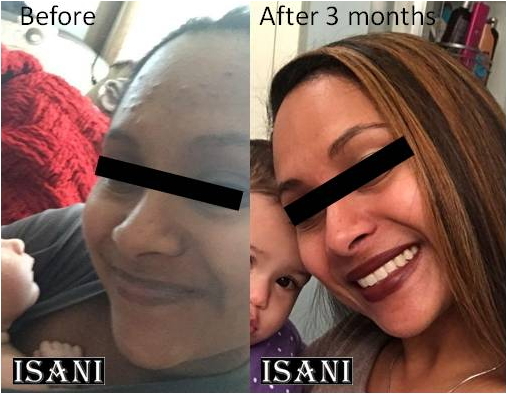 ISANI is amazing! I have acnes when I first enroll into University. The acnes getting really serious and I lost my self confidence standing in front of peoples. My acnes started to dry up and I saw huge improvement after using 2 months. It is amazing after 4 months, my face has totally clear from acnes! When I first know this product, I can’t believe it has so many functions. But now I love it so much. 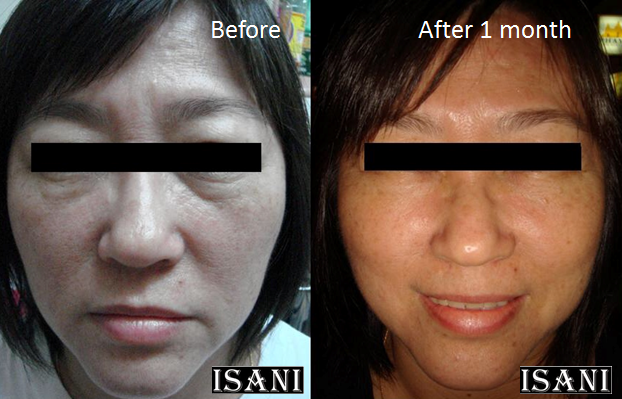 My facial pores and eye bags reduces and my face much firmer. I look younger than my biological age. Thanks to my nephew who introduce me ISANI. It help me save time and money. I do not need any other treatment anymore. I used to have girlfriend who dare not kiss on my cheek due to the terrible acnes. 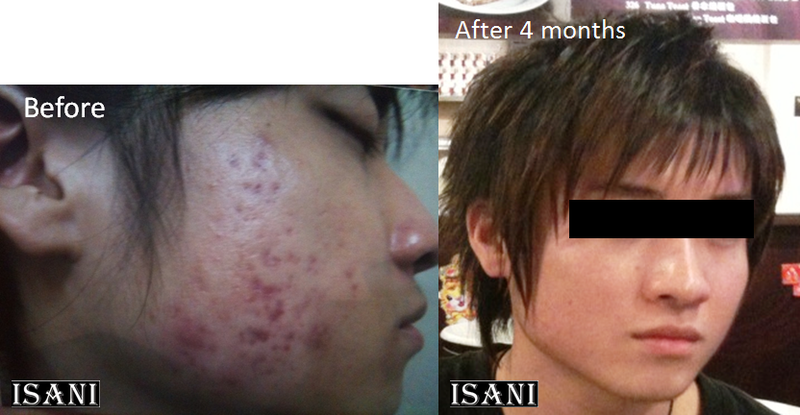 My acnes all cleared after 4 months using ISANI. I look handsome and have lot of girls admired me now. Thanks to ISANI! My friend always make joke out of me, saying I look like a drug addict. After using ISANI facial bar, now they say I look like Korean movie star! What so special about ISANI is it doesn’t caused my skin dry unlikely other soap. I felt my skin moisture and smooth after using it.